It’s one of the nephew’s birthdays this weekend, and for once we’re not on birthday cake duty… but that doesn’t mean we’re not going to bake something to take to the party! I’ve had these piñata cookies on my list of things to try for ages. They look great, and have the fun sweets in the middle, so I decided that’s what I’d do. Then I actually looked at the recipe. 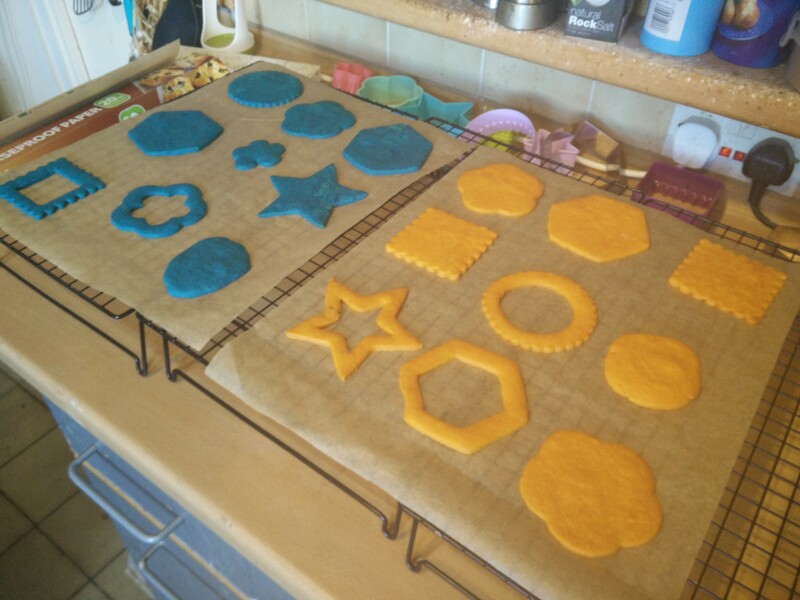 There’s a lot of faffing about with layering up different of colours of dough, freezing, slicing, baking, then cutting out shapes after baking, with no explanation of why you do this rather than cut before baking. So I’m making some changes. 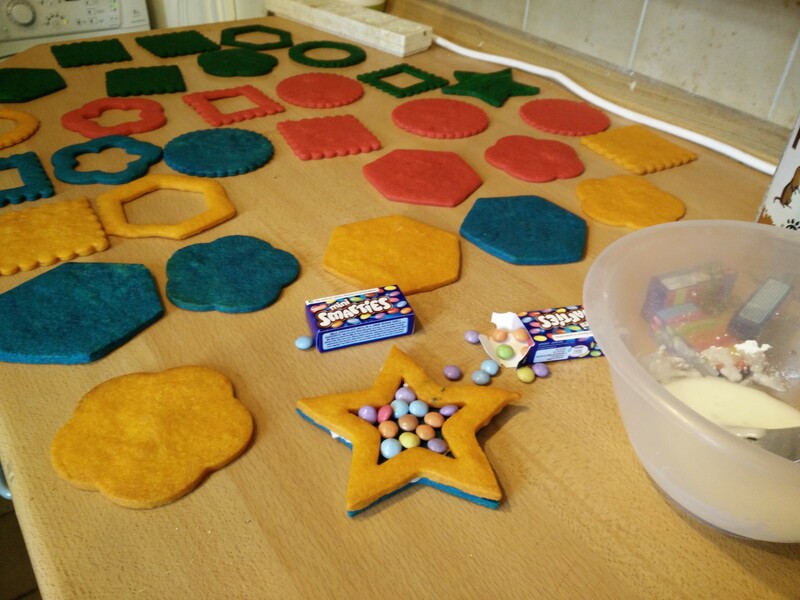 Firstly I’m going to go with a tried and trusted cut-out cookie recipe I use for xmas decoration cookies. 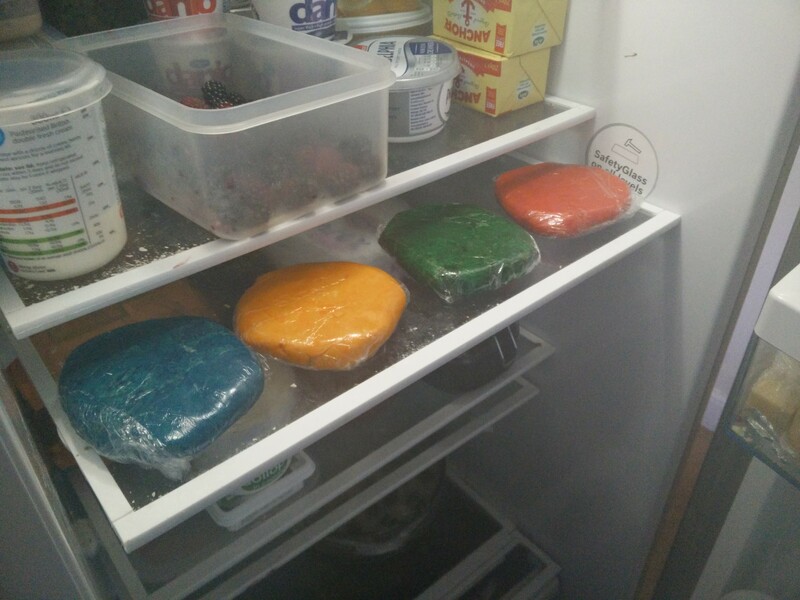 This has the added benefit that because it uses the reverse creaming method I can split into batches after doing the reverse creaming, and add different colours to the batches as the cream cheese is added, thus avoiding over-working the dough to get the colours in after it’s been made. Then instead of the layering/slicing to make stripes, I’m just going to roll out and mix and match colours in the layers. Not as much fun, but a lot less hassle. 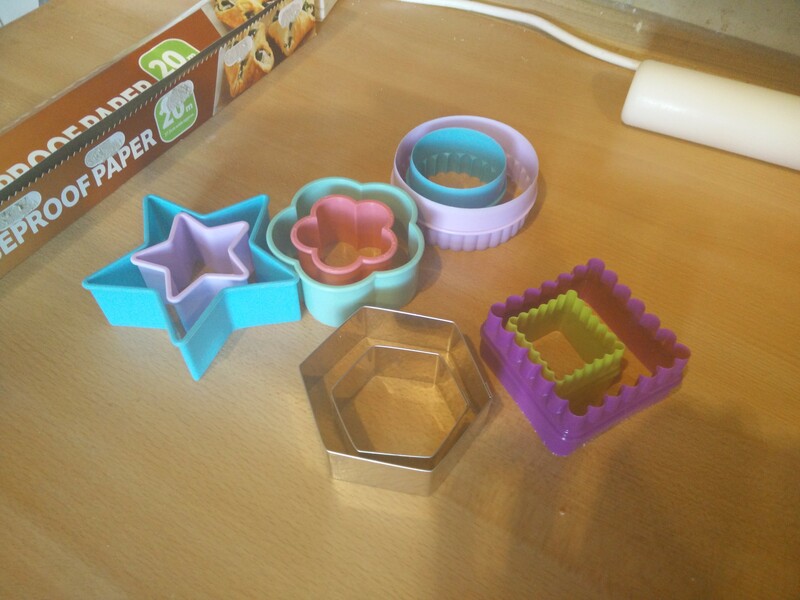 For shapes I’m going to use anything I’ve got in multiple sizes, so I can use smaller sizes to cut out middles, rather than fiddling around using multiple small cutting as the original recipe does. So after much laborious cutting, I bake them in a couple of batches. After baking and cooling it’s just a matter of assembling, using water icing to glue the layers together with the mini Smarties in the middle. They rattle! I was worried the thin gap would mean the Smarties would just be jammed in there without being able to move, but they are free to move around which is cool because A) they can be rattled, and B) when you bite into them the Smarties will fall out! Let’s hope the kids like these tomorrow. 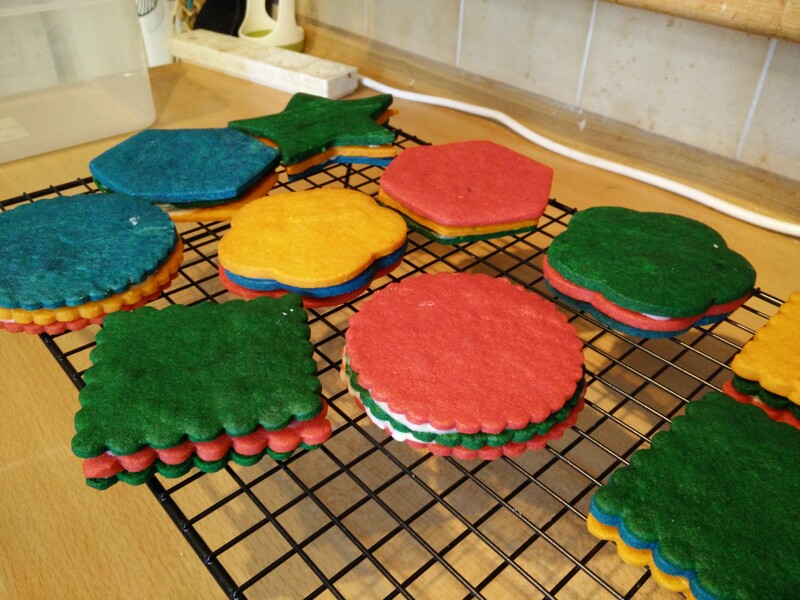 These really colourful biscuits look great – just the thing for a young lad’s party. More exciting than ordinary cake too.